A 12.3-inch Chromebook tested with Chrome OS 67.0, an Intel Core m3-7Y30 1GHz processor, 4GB of memory, Intel HD 615 graphics, a touchscreen, and a 32GB eMMC drive. 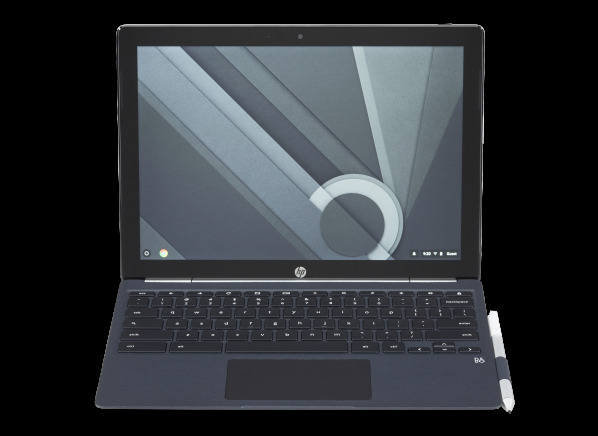 The HP X2 12-F014DX is a 12.3-inch Chromebook with an LCD resolution of 2400 x 1600. It has 4GB of memory and a 32GB eMMC drive. It has an Intel Core m3-7Y30 1GHz processor and Intel HD 615 video adapter but no dedicated video memory. It was tested with Chrome OS 67.0. The HP X2 12-F014DX has a built-in Micro SD memory card reader for digital photography, a touch screen, and 2 type-C USB ports. But you will lose a USB port to the power cable when charging the Chromebook. It supports WiFi 802.11ac, so it's compatible with the latest high-speed routers. It is compatible with Google Play for downloading Android apps and games, and it has a gyroscope and accelerometer that can enhance interaction. The HP X2 12-F014DX measures 11.5 inches wide by 0.7 inches high by 8.7 inches deep and it weighs 3.2lbs. It's backed by a 12 month warranty, with 12 months of free tech support by telephone.